An illustration of the three neutrino mass states and the three flavors that make them up (electron, muon and tau), as they were previously thought to mix. NOvA’s new result shows that the third mass state may not have equal amounts of muon (yellow jellybeans) and tau (blue jellybeans) flavors. Scientists from the NOvA collaboration, including University of Minnesota researchers, have announced an exciting new result that could improve our understanding of the behavior of neutrinos. Neutrinos have previously been detected in three types, called flavors – muon, tau and electron. They also exist in three mass states, but those states don’t necessarily correspond directly to the three flavors. They relate to each other through a complex (and only partially understood) process called mixing, and the more we understand about how the flavors and mass states connect, the more we will know about these mysterious particles. As the collaboration will present today at the International Conference on High Energy Physics in Chicago, NOvA scientists have seen evidence that one of the three neutrino mass states might not include equal parts of muon and tau flavor, as previously thought. Scientists refer to this as “nonmaximal mixing,” and NOvA’s preliminary result is the first hint that this may be the case for the third mass state. “Neutrinos are always surprising us. This result is a fresh look into one of the major unknowns in neutrino physics,” said Mark Messier of Indiana University, co-spokesperson of the NOvA experiment. The NOvA experiment, headquartered at the U.S. Department of Energy’s Fermi National Accelerator Laboratory, has been collecting data on neutrinos since February 2014. NOvA uses the world’s most powerful beam of muon neutrinos, generated at Fermilab, which travels through the Earth 500 miles to a building-size detector in northern Minnesota. NOvA was designed to study neutrino oscillations, the phenomenon by which these particles “flip” flavors while in transit. The data also show that the third mass state might have more muon flavor than tau flavor, or vice versa. The NOvA experiment hasn’t yet collected enough data to claim a discovery of nonmaximal mixing, but if this effect persists, scientists expect to have enough data to definitively explore this mystery in the coming years. 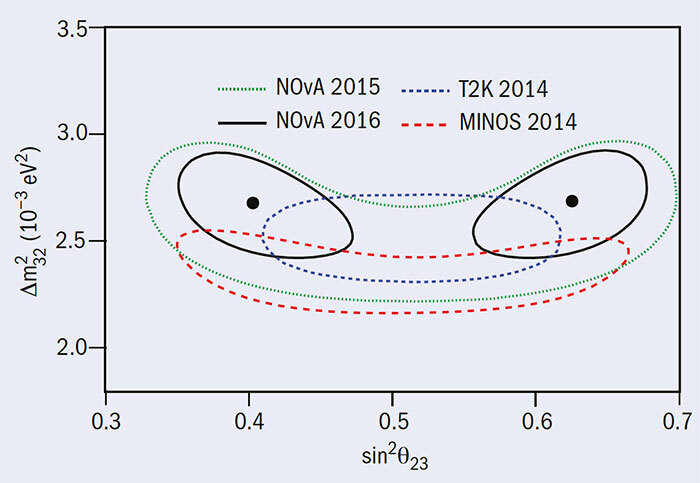 The NOvA experiment’s preliminary result shows an equal possibility that the third neutrino mass state is dominated by either muon or tau flavor. Image: NOvA collaboration. NOvA will take data with neutrinos and antineutrinos over the next several years. With both detectors running smoothly and Fermilab’s neutrino beam at full strength, the NOvA experiment is well positioned to illuminate many of the remaining neutrino mysteries. The NOvA experiment is funded by the U.S. Department of Energy Office of Science, the National Science Foundation and other institutions worldwide. Fermilab is America’s premier national laboratory for particle physics research. A U.S. Department of Energy Office of Science laboratory, Fermilab is located near Chicago, Illinois, and operated under contract by the Fermi Research Alliance LLC. The DOE Office of Science is the single largest supporter of basic research in the physical sciences in the United States, and is working to address some of the most pressing challenges of our time. For more information, please visit http://science.energy.gov. For more information, visit the on NOvA, visit NOvA website.